Passengers riding on trains, subways and trolleys are entitled to a very high duty of care from the operator of the train line. If you are injured because of the negligence of the conductor or the engineer, then the train company is liable for your injuries. Unfortunately, many train companies do not readily accept responsibility for their negligence. There are over 600 railroads and 200,000 miles of track in the United States. From 2005 through 2010, there were approximately 30,400 train accidents, killing more than 4,800 people, according to the U.S. Bureau of Transportation Statistics. Many of these accidents were due to the negligence of the railway company, but accidents can also be caused by the negligence of motor vehicle operators, who fail to yield at railway crossings. Many accidents are caused by inspection and maintenance violations. Railroad companies and commuter rail lines, including the MBTA and the MBCR, are considered common carriers and as such they are held to heightened liability standards by the Federal and state government. A common carrier is generally required to exercise the utmost care, diligence and vigilance in transporting passengers. Train accidents can involve locomotives, MBTA commuter rail, subway, trolley, or local light rail systems. They can happen at crossings where the safety equipment fails or at unprotected crossings where there are no lights or signals to indicate an oncoming train to passenger vehicles. Trains can derail due to improper track maintenance or mechanical failure. Driver fatigue can contribute to train and railway accidents. Excessive speed is often a cause of train or trolley accidents. Train accidents can also lead to hazardous cargo spills, which can injure or kill nearby residents. Immediate investigation and preservation of evidence is often a critical element in proving a personal injury case involving train, subway or trolley accidents. Investigation involves examination of the scene while the evidence, such as skid marks and gouge marks, is fresh. After a train accident, it is also critical to establish contact with the investigating authorities, who often will do accident reconstructions. It is essential that you immediately hire an experienced train accident attorney to investigate your claim. It is also essential that you get prompt medical attention for your personal injuries. Please see our car crash page for more details on what you should do to protect yourself after a serious train accident. Train companies, commuter rail authorities, maintenance companies, design and engineering firms, construction firms, and others may be responsible for accidents arising from train, subway or trolley collisions or other train accidents. Usually train operations include large insurance policies or self-insured companies or authorities which are capable of fully compensating train accident victims. Hiring an experienced and qualified Massachusetts train accident lawyer is essential. The lawyers at Breakstone, White & Gluck, P.C., are experienced in getting compensation for victims injured in railway and railroad company accidents. The attorneys at our firm handle cases from initial investigation, through trial, and, if necessary, all appeals. Your legal rights need to be protected after a railroad accident. You should hire an experienced train accident attorney, one who understands the many complex laws and regulations in this highly regulated industry, and one who has the resources and experience to evaluate and handle your case. Immediate action may be required to preserve all of your rights. All accidents in Massachusetts are governed by a Statute of Limitations. Some accidents also have shorter notice provisions which may be very strict. For more information on selecting a Massachusetts train accident lawyer, please see our page on Choosing a Personal Injury Lawyer. Our Case Results page describes the accident cases we have successfully handled on behalf of our clients. If you feel you have a case, it is vital that you act immediately to protect your rights. Please call us at 617-723-7676, or toll free at 1-800-379-1244, or use our contact form to send us an e-mail, or email us at contactus@bwglaw.com. Get your free legal consultation today with Breakstone, White & Gluck, P.C. Bus Accident Injures More Than 30 Students on Boston Overpass State Police are still investigating the bus crash that injured dozens of students last weekend on Soldiers Field Road in Boston. 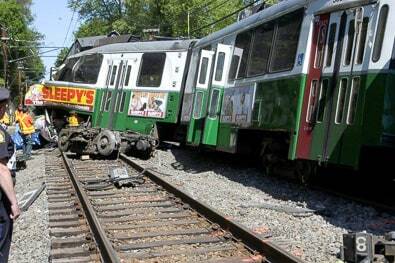 MBTA Green Line Crash Under Investigation Officials investigate yesterday's Green Line crash that sent 37 people to the hospital. Boston Welcomes New Bike Share Program Breakstone, White & Gluck congratulates the City of Boston and Boston Hubway for the recent launch of the innovative bicycle sharing program.